"Whether over hot biscuits, chicken fried steak, omelets or mashed potatoes, this country gravy is the best, or so I've been told many times by friends who ask for it when they come to our home." Melt butter in a large pot over medium heat. Cook and stir onion in hot butter until softened, about 3 minutes. Crumble pork sausage and spicy pork sausage into onion; cook and stir until sausage is browned and cooked through and onions are tender, 7 to 10 minutes. Stir flour, salt, and black pepper into sausage mixture, adding additional butter if mixture is too dry, and cook until flour begins to brown, about 5 minutes. Pour milk into sausage mixture, increase heat to high, and bring to a boil, stirring constantly, adding more milk if mixture is too thick. Reduce heat to low, cover the pot with a lid, and simmer, stirring occasionally, until flavors blend, about 20 minutes. See how to make a savory, sensational, milk-based sausage and bacon gravy. Gravy can be held, covered, in a 200 degrees F (95 degrees C) oven for up to an hour before serving. You will have to add a little more milk because it will thicken while waiting to be served. Gravy can also be made one day in advance and just reheated over low heat, stirring occasionally, or in a 300 degrees F (150 degrees C) oven for 20 to 30 minutes. If time allows, bring to room temperature before reheating. Gravy freezes beautifully so make a full recipe while you're at it. This was a great breakfast! I like the mix of spicy and mild sausage and the addition of minced onion. 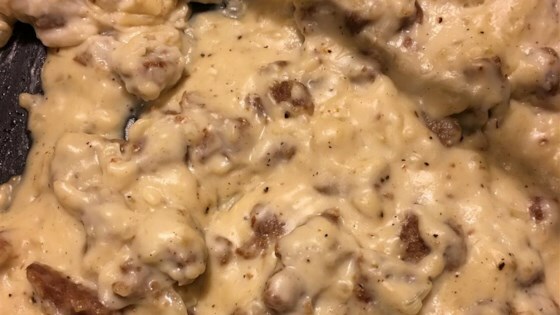 This added some nice flavor to traditional sausage gravy. Will make this again! Made it Loved it! However didn't use as much sausage as called for and I forgot the butter but I loved it. Must try recipe. Family doesn't care for onions in gravy. Used Carnation can milk plus a can of water. Excellent! This was the first time I attempted homemade gravy. This recipe tasted just like the gravy my mom used to make!